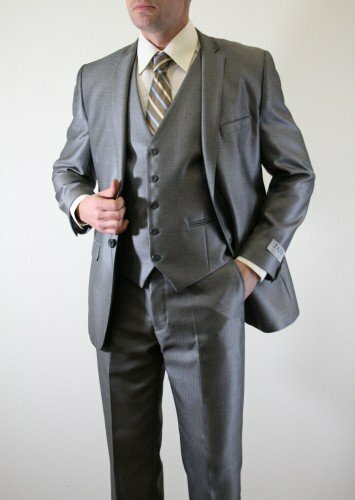 If I were to ask you what color Mens Suits come in more varieties and shades than any other, your answer may and should be the grey suit. You can find a Grey Suit in more shades,stripe combinations and styles than any other suit available. 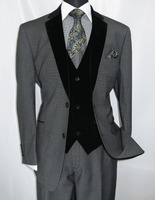 You can have a hundred grey suits and no two will be the same, that is how versatile the color grey is. I always like to think of a Grey Suit as a blank canvas in which to express your personal style by the color palette of shirt and tie combinations you are willing to wear. You can make a grey suit either muted by wearing muted colors of shirts and ties or make your grey suit simply explode by wearing bolder neck ties and a white shirt. 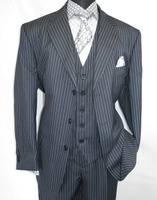 You can find grey suits that come either solid or slightly woven drop needle patterns or hundreds of stripe and pinstripe choices from fine narrow pinstripes to bold in your face chalk stripes. 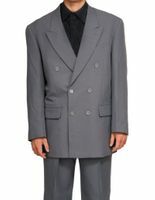 Grey suits for men naturally come in your basic single breasted two piece suit to your outrageous three piece long jacket zoot suit. You will never find a shortage or choices available. Wearing a grey suit is one of the business basics that no man should be without. 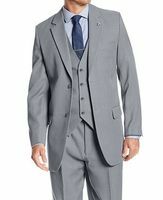 You can easily fill your wardrobe with dozens of grey suits without even trying because of the vast amount of choices. Like potato chips, when it comes to grey suits for men you can't have just one. 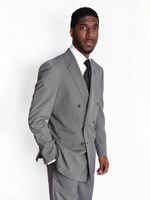 Shop for Grey Suit Here at a great price. How is it that Stacy Adams suits can put a vintage era twist on a classic style. Just when you thought all grey pinstripe 3 piece suits were the same, along comes this Stacy Adams grey pinstripe 3 piece suit.